By accelerating the pace of innovation in learning sciences and technologies, the United States has the opportunity to close the achievement gap, improve national competitiveness, and drive economic growth. Accelerating the pace of innovation requires a fresh approach to research and development and the infrastructure that supports it. Creating a new education innovation ecosystem requires new types of partnerships that cross traditional domain silos. This has been demonstrated in other industries that have been successful at accelerating innovation. Across the country education innovation clusters are forming, where forward-thinking partners focus on breakthroughs in learning technologies, streamlining research in learning science and accelerating the development of new tools and approaches for learning. In combination with a supportive regulatory and funding context, these innovation centers have the potential to lead the nation in the creation of new knowledge, tools and outcomes. 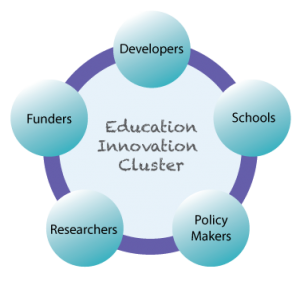 To be considered an education innovation cluster, a region will articulate the connection between three key partners; educators, researchers, and entrepeneurs – each adding their unique strengths to the network. Education Innovation Clusters accelerate the pace of innovation by bringing together education, research, and commercial partners. Educational partners provide an environment where emerging learning technologies can be piloted and new solutions can be developed with input from students and teachers. Educational partners might be early learning providers, public and/or private schools, libraries, community centers, after school programs, institutions of higher education, or virtual learning environments. These innovative schools and learning centers provide the flexibility and capability to rapidly develop, test, and collect data on new approaches and products. Research partners conduct basic and applied research related to advancing the field of learning science. They can be integrally connected to the entrepreneurial partners to ensure effective design of learning technologies. They would also have deep relationships with the educational partners to streamline the collection of data and outcomes to conduct ongoing evaluations of the products and approaches developed in the cluster. Commercial partners infuse new technologies to address problems and help scale and market successful implementations. They can also provide investment capital to accelerate the commercialization of intellectual property and increase the probability of success of new enterprises built on the knowledge and solutions generated in the cluster. The quality and relevance of products will greatly improve with consistent access to the educational and research partners in the cluster.